One race was scheduled for today. After a brief postponement waiting for wind, the race started at 11:30 under blue skies and a moderate 12 knot breeze. The course for all the fleets on the Fort Mason race track took us outside the Golden Gate bridge for to a buoy off Pt. Diablo. It’s always impressive to sail out the Golden Gate. And even more fun to sail back in! From there we went all the way east to Berkeley and back up to the bridge before finishing in front of the St. Francis Yacht Club. Tom Jenkins and his DFZ did well again today and won the race. On Double Trouble we battled hard to finish second today. That capped off a great week for us winning the J70 Class at the 2014 Rolex Big Boat Series. I really enjoyed the J70! Great boat, challenging and fun at the same time. It really is a dinghy and all the subtleties make a difference. I also really enjoyed my team mates, Andy Costello who did a great job steering, Nick Catley on the sheets and James Clappier (aka Hippie) on the bow. Jeff Thorpe from Quantum Sails helped us a lot last week by coaching us and getting us up to speed in the boat. Next race for me is the Bart’s Bash and Leukemia Cup next Sunday. I am sailing again with Andy and Hippie on Andy’s J-125. Thank god Andy has so many boats! If your not involved in these great events, Google them and get involved! Two long races today for the J70 fleet. Once again we started the day on the Fort Mason race track. The committee signaled a three lap windward-leeward course in the 8-10 knot southwesterly breeze. The current was “flooding” once again so it was all about hitting the beach for relief. We had a good start and rounded the first mark 4th. We passed a couple boats on the next lap but could not get passed DFZ, who was sailing great and won the race. Our second place finish further solidified our lead in the series. The second race was a marathon of three hours! 15 miles in a big flood tide is a long course for J70’s. We were over early at the start but did not hear our sail number called for more than a minute after the start. Needless to say, we were deep on the first leg. Then we got in a big entanglement at the first mark and felt we fouled. So after rounding we did two penalties and once again, we were second to last. The course was a marathon all around the bay, and there were a couple of opportunities where we went a different route to some of our competitors and made some gains. The wind picked up to 22 gusting 25 knots. Our speed was good and Andy did a great job driving, especially downwind! In the end, with the help of the leaders having a few problems if their own, we managed to work through the fleet for the win. Tomorrow there is just one race and it will be long for sure. Friday was a very good day for us on Double Trouble. In the first race we were on the Fort Mason race course with about 10 knots of wind. We were over the start line early and had to go back and restart putting us last in the 13 boat fleet. The current was “flooding” (coming in the bay) and our first mark was up toward the Golden Gate bridge. The whole fleet was tacking back and forth in a very narrow band, about 100 yards wide, along the shore, to stay out of the worst of the adverse current. This makes it very difficult to pass because there is a lot disturbance of the wind for boat that are downwind of the pack. Andy Costello steering, Nick Catley the jib sheets, James Clappier calling the wind and me on the main sheet, all did a great job of working the shoreline and getting “out of phase” with the boats ahead of us. After about 30 tacks on the two windward legs and smooth sailing downwind in the favorable current, we finished second! Nice Comeback! For the second race we moved out to the Alcatraz race course. The wind built to 15 knots by this time. The current was still flooding hard out there in the middle of the bay but there was no shoreline to close enough for the length of the first leg. This spread the fleet out a lot more than the first race. We had a good start nearly the left end of the line and were in the lead the entire race. It is much easier when you do it that way! We are all pretty tired after a day like that. These small boats are very physical especially in the conditions on SF Bay. Today’s 2,1 scores put us in first place overall, one point ahead of “Bottle Rocket”. Two more races Saturday and one Sunday. This year marks the 50th anniversary of the Rolex Big Boat Series. Day 1 served up pretty familiar conditions. Moderate winds from the southwest for the first race then 18-22 knots for the second race of the day. There are 10 fleets spread out over three race courses. 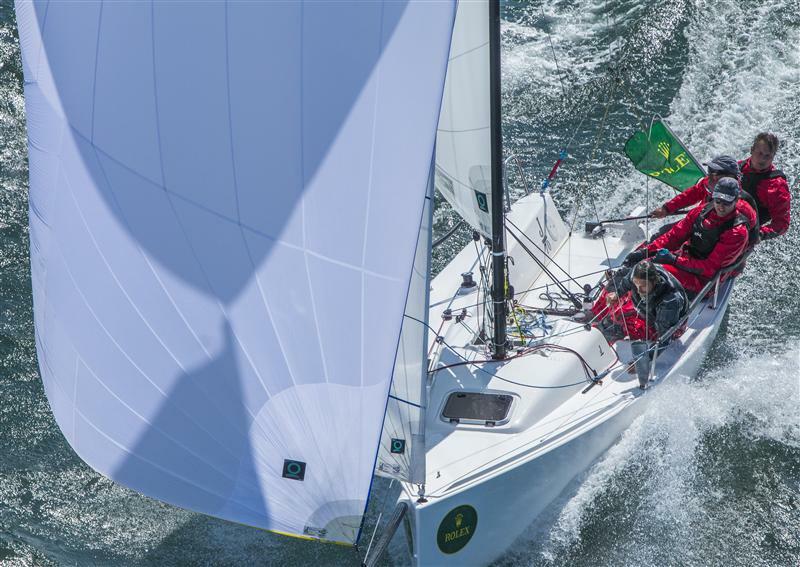 Sail boats racing from a MOD 70 to a fleet of J70’s and everything in between are racing this year. Over the years I have sailed everything from 82′ maxi boats to this J70 which is about 22′ feet long. My first Big Boat Series was in 1977 on a cold molded Farr yacht called “Sweet Okole”. In those days, the Big Boat Series was a week long event with racing on Sunday, Monday, Wednesday evening, Friday and Saturday. That was back when people didnﾒt have to work I guess. The Wednesday evening race was a classic with the balcony’s around the club filled with spectators, all enjoying libations. The sailors would hit the bar around 8:00pm to find a rowdy crowd awaiting them. Also, the evening race often featured a dying wind and sometimes evening anchoring to hold position against the current. This year, I am sailing with my friend Andy Costello on his J70, Double Trouble. 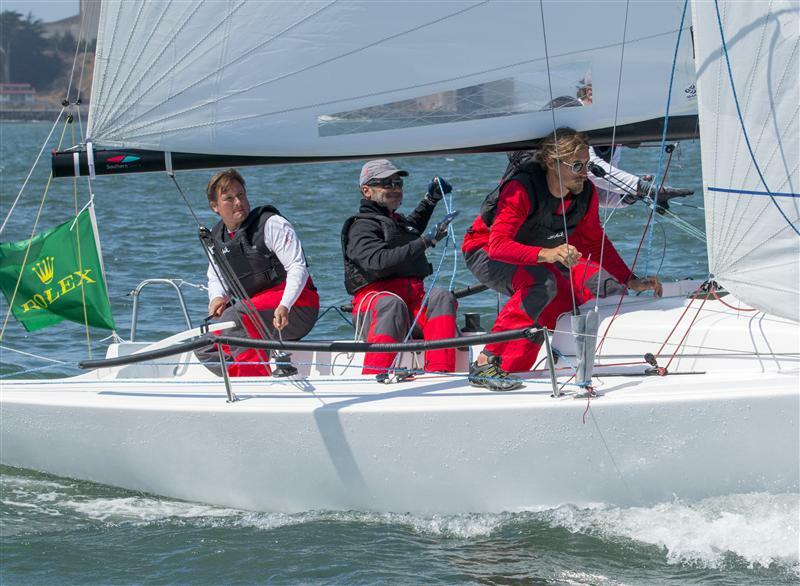 The J70’s like the Melges 20ﾒs are enjoying great popularity. There are 13 J70’s here this week notwithstanding the fact that the world championship is taking place in Newport RI at the same time. The one design aspect, a vary light and fast boat, relatively inexpensive, 4 person crew all combine for big bang and big fun for your buck. Two races were held today. The J70’s raced on the Fort Mason race course for the first race. The wind was about 8 knots at the start and the current was “flooding” meaning coming into the bay. Because the first leg was against the current so the fleet headed toward the shore side of the course, for relief. We had a bad start getting trapped outside the heavily favored right hand end of the line. We chipped away and finished 8th. 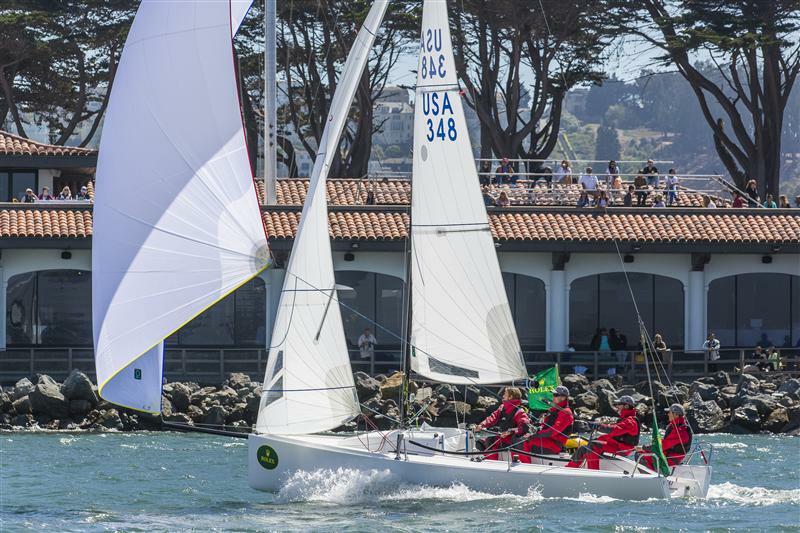 For the second race, the J70 fleet moved out to the Alcatraz course and now the wind was pumping in at 18 knots. The race committee signaled for a longer race, up and down the city front 3 times. We were in 4th place at the first mark and third at the end of the first run. Up the second windward leg, we got involved in a tacking duel and lost a bit of ground and then fouled another boat. We did our penalty turn and fell back to 6th. Andy and my team mates Nick and James did a great job of overcoming a few difficult moments to come through for the win. Sailing these little boats in 20+ knows is a handful. They are overpowered up wind so the sails fall the whole time and its about finding a balance in trim that allows the mainsail to set without tipping the boat over. Downwind they rip! but they also can crash and burn and when that happens, you lose a lot of ground over the team who keep their boat upright and planing. Racing continues tomorrow through Sunday with 5 more races scheduled.